In honor of St Patrick’s Day this weekend, I’m breaking out my green recipes. I started the day with matcha powder in my oatmeal for a nice pinch of green, and now I’m working on the bowlcake green. I’ve experimented with spinach in protein shakes before and I swear without the cool green color, you’d have no idea that there was spinach in there. 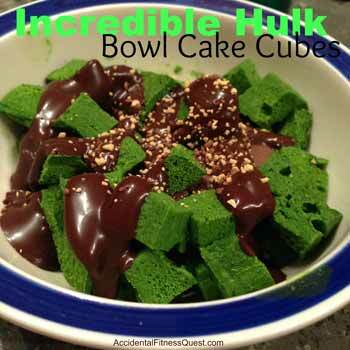 I also love adding spinach to bowlcakes just for the fun green color. Mix all ingredients in a Magic Bullet or blender and blend until smooth. The amount of water you need will vary based on how dry your batter is. You want cake batter consistency because… it’s a bowl cake. Most times I use 2 – 3 tablespoons of water but sometimes need to add a little more. Pour the batter into a microwaveable bowl and microwave for approximately 3 minutes until the cake is done. Makes one cake at approximately 89 calories – 9g protein, 9g carbs, and 1g fat. You can probably use regular or whole wheat flour in place of the coconut flour. Adjust the water though since regular flour will need much less liquid. If you like a sweeter cake, use more stevia, sugar or alternate. Consider what you will be eating your cake with too. If you top it with sweet toppings, you might need less sweetener than you think. Kids will probably prefer the cake sweeter so keep your audience in mind too. You can always taste the batter (if using carton egg whites! ), and add a little more at a time. You can also sub in 85g of tofu in place of the egg whites for a vegan version. I cut my cake into cubes and dumped them on top of chocolate protein ice cream. Then there was the mandatory sugar free chocolate syrup and a small pinch of sprinkles on top. Life is always better with a little pinch of sprinkles. Since the spinach keeps the calories so low, you could probably make an orange pumpkin bowlcake and mix it together with the green one for a festive combo.